It wasn’t exactly like at first sight, but dealing with a total stranger who storms into your reclusive cabin life in Alaska demanding the answers to life’s wrongs since the dawn of time isn’t easy. Audience’s emotions will ebb and flow and they will laugh and cry along with the alternately outlandish and infinitely poignant trajectory of the play “Brilliant Traces,” starring Charlotte Hemmings and Chris Wendelken. 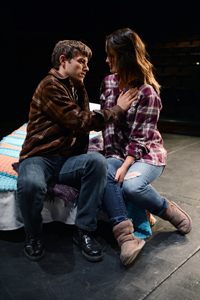 The one-act play—directed by Jonathan Kane—first was presented by New York’s prestigious Circle Repertory Company. The absurdist allegory uses fantastic characterizations to probe into the nature of modern relationships. The play opens tonight, Sept. 4, and runs through Sunday, Sept. 8, at the nexStage Theatre in Ketchum. Tickets are $25 for general admission, $35 for reserved seating and $15 for students. Opening night includes champagne. “We did a reading of ‘Brilliant Traces’ two years ago and the audience response was tremendous,” said Kane. “The play is beautifully written and really connects with people on a deep visceral level, which was the main reason we chose it for a production. Wendelken, whose career includes New York theater and television parts, holed up like the hermit his character Henry is for days before the rehearsal. Local Hemmings, as Rosannah, has been in fast and furious mode, learning her lines and her character between her work at Smith Sport Optics, art and being a new wife. She just recently began working with Wendelken—the result, she said, makes the chemistry that happens even more plausible. The play runs the gamut emotionally, Hemmings said, “from hysterically angry to hysterically crying.” And is still very funny and not a downer, she said.